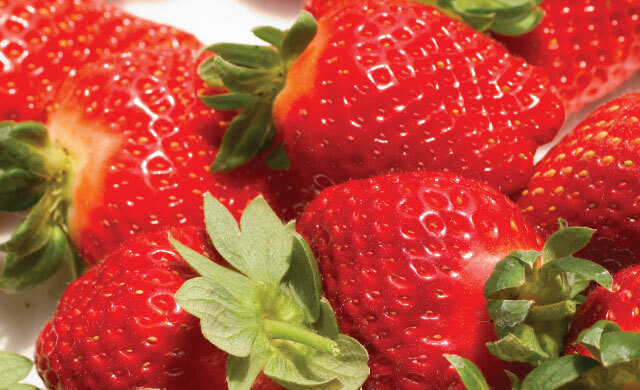 Its strawberry season and nothing tastes more like summer than these juicy, freshly picked berries. Besides their great taste, there are lots of healthy reasons to include them in your diet. One cup of fresh strawberries gives you more than 100% of your daily requirement of vitamin C. This vitamin is a powerful antioxidant and also helps maintain a healthy immune system. They also provide healthy amounts of potassium, an important mineral which helps regulate your blood pressure. A cup of sliced strawberries contains only 50 calories, is naturally fat free and low in sodium, making them a great snack for people watching their weight. That same cup contains 3 grams of fibre, some of which is soluble fibre that helps lower cholesterol, making them a heart healthy food. They also contain flavonoids including anthocyanins and ellagic acid, which have strong antioxidant properties. There are lots of ways to love your berries. Besides eating them as is, you can add them to a mixed spinach salad, make a strawberry salsa, strawberry pancakes or a yogurt/berry parfait. One of my favorite summer breakfasts is spreading low fat cream cheese on whole grain toast and slicing fresh strawberries on top. Buy lots of local strawberries while they are in season and then freeze some for a taste of summer in January. Wash and hull the berries and pat dry. Freeze in a single layer on a baking sheet. Transfer to freezer bags and store in the freezer until ready to use.